The Rac is another avian race. 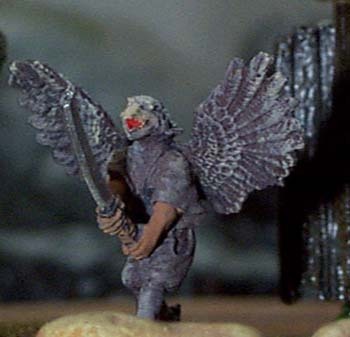 However, where the Eldorin have elf characteristics, the Rac have more bird like characteristics. They have far greater strength than the Eldorin and are much more war like in nature. The Rac have the greatest vision acuity of all the races. May carry 7+1d3 very large items. The Rac grows to between five and six tall and will normally weigh between 180 and 220 pounds. The Rac has triple normal Vision Acuity. This means that if the Rac is 100 feet from an object, he will see it as if he were only 33 feet away. The Rac may fly but not hover. The Rac's flying speed is 25. The Rac must be moving at a charge speed for one round before being able to take off. The Rac is unable to make attacks or cast spells while flying. The Rac can fly only if carrying a weight equal to or less than their free weight figure. They cannot fly if wearing metal armor. The Rac needs at least a 20 foot wide by 20 foot high passage to continue on in full flight. If the Rac falls over 20 feet he or she may use his or her wings to land without damage. If the fall is 40 feet or more the Rac may choose to go into full flight or to continue on down to a soft landing (space may not permit full flight). The Rac may break his or her fall in holes that are at least 10 feet wide by 10 feet long (but remember it has to be at least 30 feet deep). If the pit or hole the Rac falls down into is 20 feet deep or less, then subtract 10 feet from the actual distance fallen (falling down a 20 foot pit is treated like a fall down a 10 foot pit). It is very hard for a Rac to suffer any real damage from a fall. This in no way negates special damage that takes place at the end of a fall (i.e., spike damage). The Following Skills are easier for the Rac to learn; Climbing, Detection, Identify Sound, Reduce Fall, and Tracking. The dice associated with these skills go from Regular 1 to Easy 2 for the Rac character. The Following Skills are harder to for the Rac to learn; Concealment, Conserve Energy, Disguise, Move Un–noticed, and Wrestling. The dice associated with these skills goes from Regular 1 to Hard 2 for the Rac character. Due to its wings the Rac finds it hard to master the following melee weapons, 2 Handed Axe, 2 Handed Mace, Morning Star, Halberd, 2 Handed Sword. The dice associated with these weapons change as follows. The dice rating for the Halberd (group formation) goes from Hard 2 to Hard 3 for the character. The dice rating for the rest of the weapons go from Regular 1 to Hard 2. It is very hard to disguise a Rac. Whenever you try to disguise the Rac, you must add +15 to the dice roll. The Rac's feathered wings make it susceptible to fire damage. Any fire attack has a 20% chance of damaging the feathers on the wings to the point where the Rac cannot fly. If unable to fly there is a 20% chance that the damage is great enough that the Rac will "fall" from the sky (taking full fall damage). It will take a Rac several months to grow back a set of feathers. When in the air and flying the Rac is considered a fast target (refer to Section 4 of the Manual, Advance Actions and Concepts-Fast Targets). If the Rac is carrying a shield then the shield’s normal Defense Adjustment (DA) adjustment is also used. It is very hard to catch a Rac in an Area of Effect spell if the Rac is in the air. To represent this, always consider the Rac at the edge of the area of affect and allow him / her to subtract five from the react dice roll in the attempt to see if he / she can avoid the spells area. The Rac's natural attack is taken in addition to one single–handed weapon attack (giving the character 2 attacks per combat round if not using a shield). Thus, if the Rac wields a long sword, it will attack with the long sword plus with its own natural attack(s). The Rac's bite attack is not overly effective since he has to get so close to the target to make use of it (i.e., read that as vulnerable). The Rac's natural attacks have the following characteristics. Please note that the TKA for the Rac does not include his own To Kill Adjustment (TKA). This means that the total normal damage for an attack will be 1d2+1d6.